A low self-esteem will make you see yourself in a negative way. We could say that self-esteem is what comes out when you consider who you are. When you have low self-esteem, it’s easy to fixate on your flaws. But you don’t have to let low self-esteem destroy your confidence. 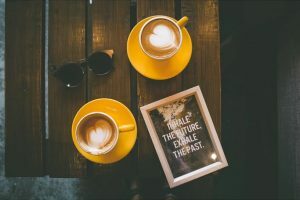 We have already seen how self-confidence and self-esteem are connected and why without proper self-esteem, no lasting self-confidence is possible. So, if you lack both self-confidence and self-belief, starting from self-esteem is a must. Here are three of the best ways to raise your self-esteem I know. People with low self-esteem often hold on to their old mistakes. They replay them in their minds again and again, wishing they could do things differently. Of course recurring thoughts on your mistakes will affect your self-belief and you could start seeing yourself as one that does more mistakes than good things. You could be easily caught in a desperate personal mission to change your past to repair to your mistakes. But the problem is that you can’t change the past and fixating to it is just another way to ensure failure. The only way to come out from this is by letting go of the past, and doing something more effective in the present. 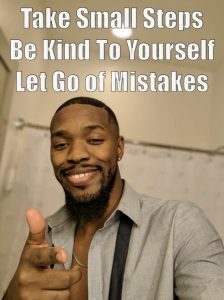 So, the first step toward recovering self-belief and increasing your self-esteem is to forgive yourself and let go of mistakes. There are many ways to raise your self-esteem by doing this. A simple but effective ritual is by journaling about your mistake, reflecting how you will do better in the future and destroying the pages when you’re finished. Any time you’re tempted to relive your mistakes, remind yourself that those pages of your life are gone and that today’s a new day. This is really the first step to get self-help for low self-esteem. A low self-esteem will mine your ambitions. If you are stuck at a job you hate, is just because you don’t believe that you can delivery greater value in your current or another job. Do you see? It’s just because you don’t have self-belief. 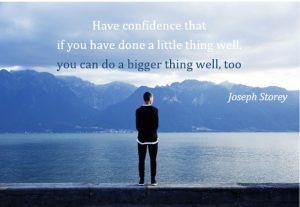 Building up your self-esteem can help find more joy in your current work and, at the proper time, find a job that you’ll enjoy. Start by looking at your current job. 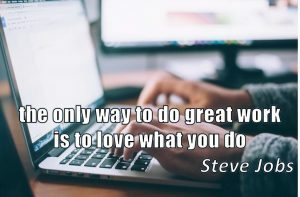 What do you enjoy? What areas do you shine in? How you are expressing value in it? How could you do more of it and give even greater value? Try also asking your boss these questions and look at your old job reviews for further insights. Of course, usually you can’t just drop you job and getting another one tomorrow. But you can always leverage what is good and you enjoy in it. Further, follow the same principle and do things you enjoy in your free time. Refresh your hobbies and experiment new ones that could open your heart to joy. This is a great opener to seeing and discovering more talents and abilities that you didn’t know you had. And of course cultivating your talents and abilities and seeing them in yourself are the best ways to raise your self-esteem and your self-belief. When you don’t finish projects you were resolved to, your energy will be locked and your self-belief in doing things will crumble. To reverse the process, you must focus on finishing projects you enjoy. Then your self-esteem will slowly recover and increase. Focus on what you’re naturally drawn to. Writing? Drawing? Creating recipes? Woodwork? Get some time to do it and finish what you started. You’ll start to feel better about yourself and gradually will free the energy to do even more of what you love. Related to finishing what you start, is also facing your fears and making your own decisions. Facing fears and deciding will enable you to complete much more and increase your ultimate self-esteem. Give a look to this nice post at guttmanpsychology.com. Try these suggestions and remember that all the best ways to raise your self-esteem work gradually on your innermost parts. Focus on taking small steps toward your goals. Be kind to yourself. Let go of the past when you make a mistake (hey, you just learned a simple process on how to do this…). You’ll develop gradually sound self-esteem and self-belief habits based on presence, love and delivery. 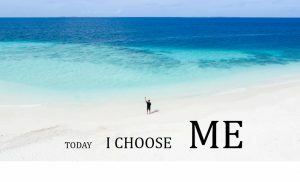 How to develop high self-esteem? 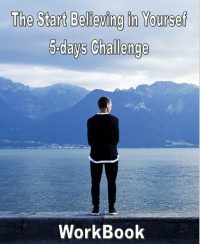 Take the first step and download my free 5-Day Start Believing in Yourself Challenge Workbook. You’ll find further suggestions and exercises based on this article. 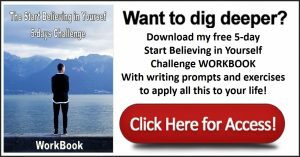 Take action right now and deep dive in learning to believe in yourself. We’re going to see next time how to overcome negative self-talk, a very important step towards your self-belief. P.S. Do you prefer a deeper journey to the discovery of your self-confidence? Join my 30 days self-confidence challenge by subscribing to the form below! 5 Engage in the 30 Days Courage and Self-Confidence Challenge!